“You may have received a letter or email recently stating that you have under used your Access to Work support package/hours. But this is wrong. AtW then say that because you have underused your package they will reduce the hours support you have. This has happened to other people too. So please check your usage very carefully. What AtW have told you may be wrong. If you think AtW are wrong, you can ask for a breakdown of the figures and calculation they have used in working out that you have underspent. If they do not send you these, you can request this again using a “Subject Access Request”. Please contact StopChanges or DeafAtW if you experience any difficulty. Justin Tomlinson tweet: A2W demand led. For those amongst you who are having your Access to Work packages cut and are continuing to struggle with the system, you’ll be pleased to note that Access to Work has been confirmed to be demand led by the minister. We will be asking for further clarification of this and why support is being cut if money is available. Access to Work … underspent….? A disgraceful track record. 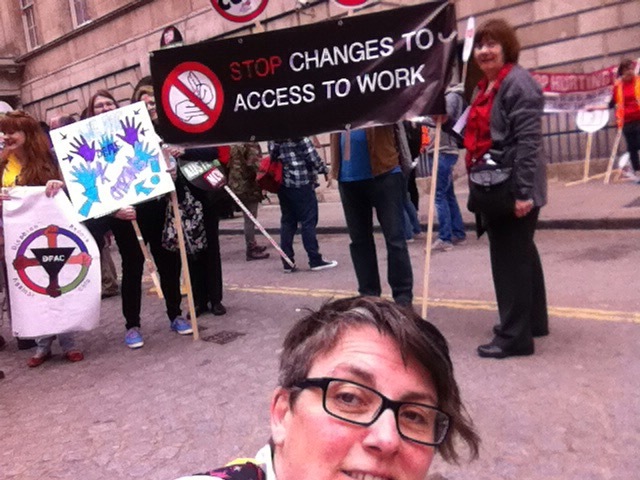 Campaigner and member of Stop Changes, Penny Beschizza has today sent a damning open letter highlighting the shocking disregard for Deaf and disabled people who have experienced two years of difficulty as a result of the Access to Work scheme by the new Minister for Disabled people, Justin Tomlinson. Speaking in London the minister revealed that AtW was underspent, this despite having made cuts to working Deaf and disabled people’s budgets. Access to Work helps disabled people get, keep or progress at work. And it’s good value for the taxpayer: according to the independent report by Liz Sayce, every £1 spent on A2W yields £1.48 to the exchequer. Sayce also described it as the “government’s best kept secret”, and the news that it’s underspent shows minsters still aren’t doing enough to promote it. At the same time, Deaf and disabled people have had awards refused or reviewed without good reason, and face a cap on their awards in the future. It’s a disgraceful track record from a government that isn’t doing nearly enough to help disabled people into employment. 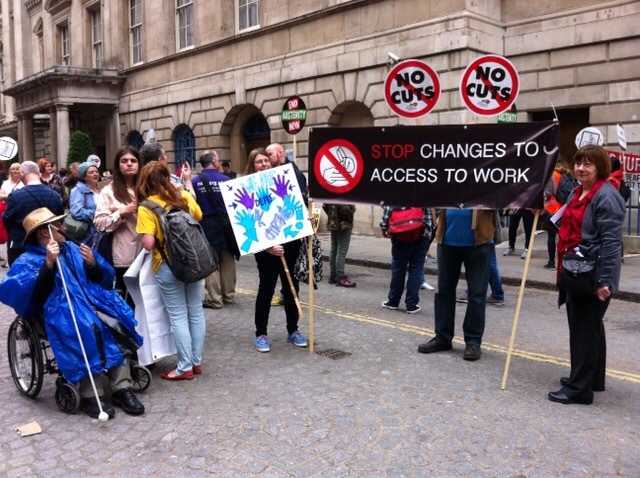 Deaf campaigners against cuts to Access to Work, which offers support for Deaf and disabled people at work, have expressed their shock and disgust at the news that £3 million of the budget for 2014/15 was left unspent. As this site has repeatedly reported, during the last 2 years, Deaf people in work have suffered from having communication support suddenly withdrawn, long delays for decisions, and poor attitudes from DWP staff who administer the scheme. These problems have led to many Deaf people questioning their future careers. Some have lost their jobs, while others have taken sick leave due to stress as a result of the problems they’re facing getting support. The news that “money is available” will come as a surprise to Deaf people who’ve had their support taken away. If money was there, why weren’t they given the support they needed? 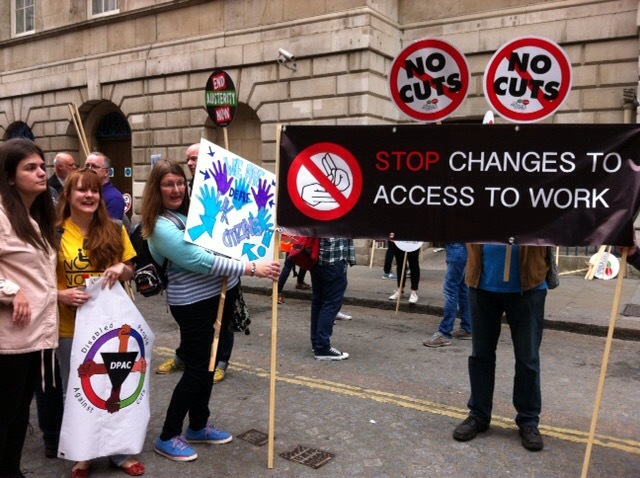 The fact that £3 million of Access to Work money being underspent during 2014 beggars belief; look at the way deaf and Disabled workers suffered through unheeded cuts and unprofessional behaviour by DWP/AtW staff, loss of prestige, loss of work, and so on. 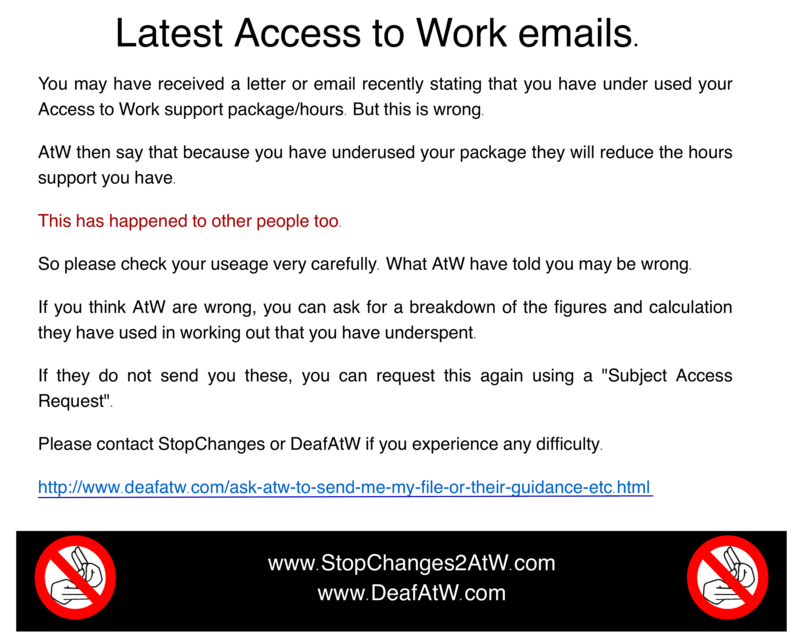 There are case studies, but these are only the tip of an iceberg of demoralised Deaf & Disabled workers who experienced unjustified treatment in their support from AtW. I have met Deaf teachers, Deaf Instructors, BSL and Deaf Education (deaf) professionals who had real AtW challenges and experienced breakdown of support through un-Deaf-friendly communications from Access to Work. Significantly, they are not keen to become case studies, because of fears that such disclosures would imperil their careers. Please do headline the issue with other unions and allies. The Government has gone too far, wasted taxpayers’ money on unconsulted changes to AtW. BUT worse of all, the way the Government allowed Access to Work to be sabotaged has robbed UK citizens. FACT: many charities funded by donations have had to use funds to fight the DWP on our behalf in the past two years. UK citizens have been ‘taxed TWICE’ – their giving towards organisations and charities concerning Deaf & Disabled people and young people have been swallowed up by the voluntary sector’s incredible work on our behalf. Therefore, ministers and civil servants did not carry out their jobs transparently and efficiently – abusing our taxes in the process. The last twelve months’ ‘remedy’ to resolve the carnage of Deaf and Disabled people’s support in the workplace cannot excuse the Government its action in the previous year’s ‘genocide’ of sustainable employment. Thank you for supporting us Deaf & Disabled workers. 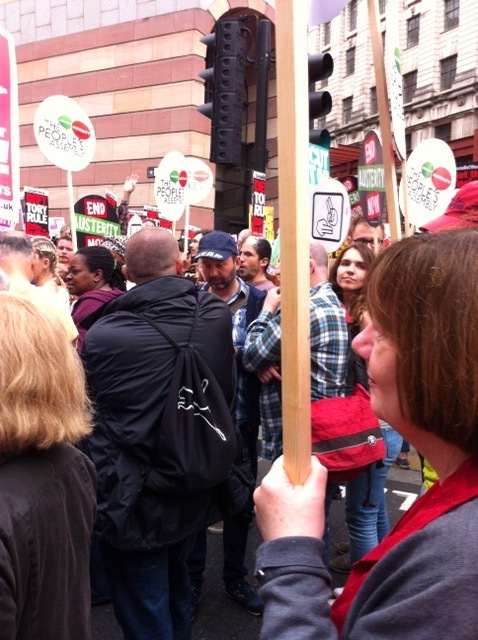 Stop Changes at the End Austerity Now demo. What an amazing show of solidarity at the weekend. 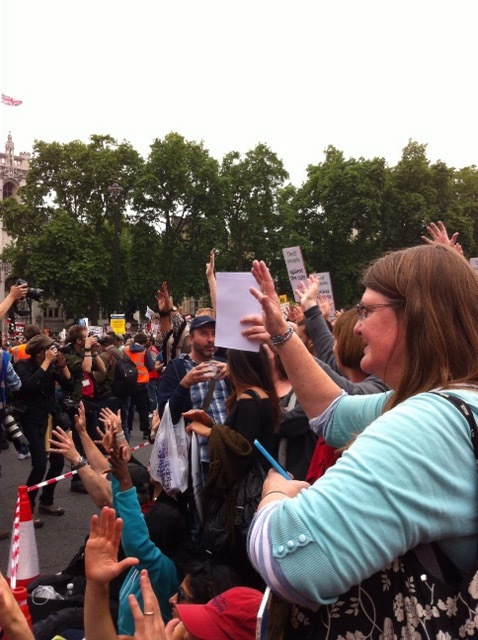 Deaf, disabled people and interpreters protesting with anti-austerity groups, local campaigns and our Trade Unions. Stop Changes were proud to be marching alongside our friends at DPAC (Disabled People Against Cuts) and NUBSLI (Natiojal Union of BSL Interpreters). Here are some of our favourite pictures. Co-Founder Geraldine O’Halloran with campaign member Penny Beschizza and members of DPAC. Campaign member Jen Dodds before the march. Geraldine O’Halloran holding our banner …and we’re off! Campaign members Lucia, Ellen Clifford, Penny Beschizza and Geraldine O’Halloran. Penny waving to the press! 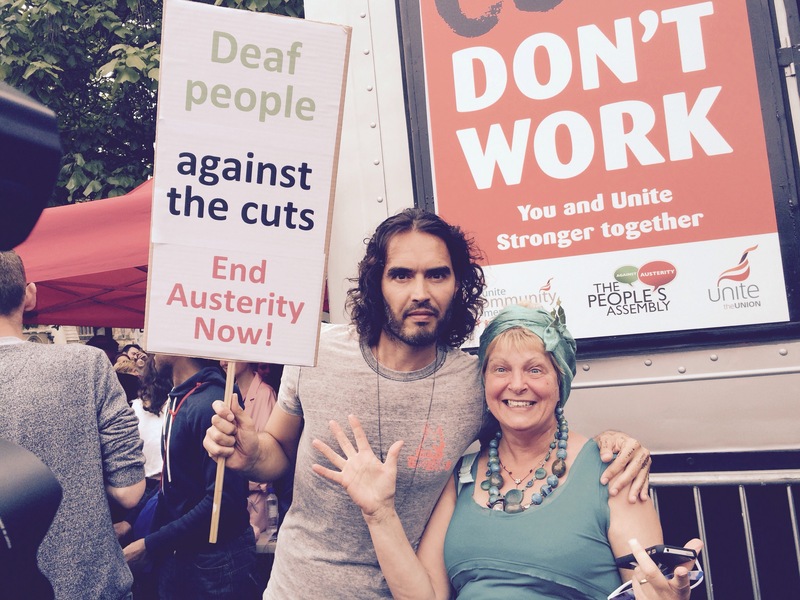 Pauline Latcham gets Russell Brand to hold a Deaf Peoe Against cuts placard! 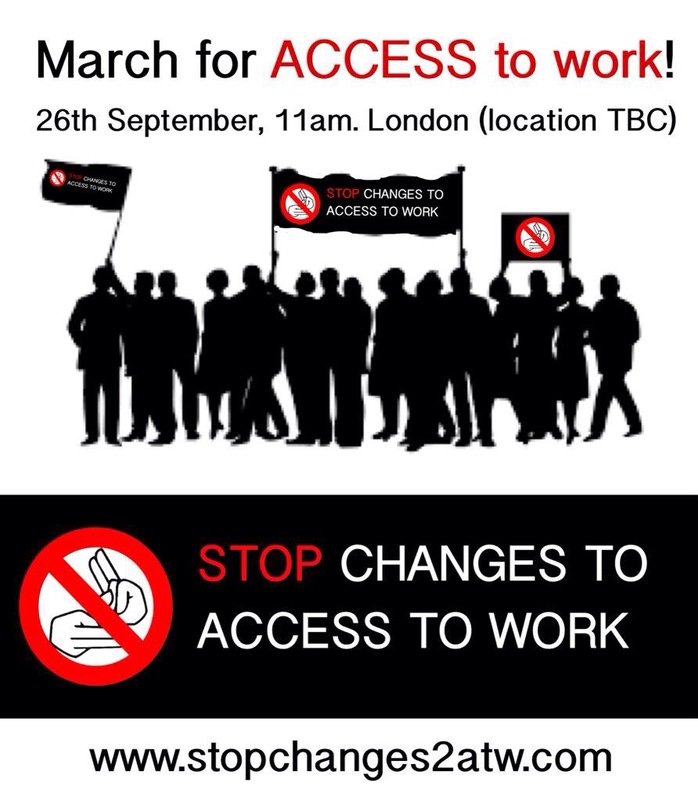 Following on from the success of Saturday’s march, we hope you will all be joining us on the 26th September. For updates please see our event page on Facebook or come back to our website! Please watch and share Jenny’s wonderful TED talk on Access to Work & the closure of the ILF and what it means for Deaf and disabled people. A letter written to the Guardian was published along with several others addressing the new Minister for Disabled people, Justin Tomlinson. read the full piece here. • The gap between the rhetoric of the new minister for disabled people, Justin Tomlinson, and the true impact of his government’s policy on disability employment support is staggering. Tomlinson says: “I am pleased that recognising disabled people’s abilities and providing support to enable them to realise their aspirations is higher up the agenda than ever before.” The reality for deaf and disabled people is one where we are increasingly held back from fulfilling our potential, particularly within the field of employment, as a direct result of changes to government policy. On 12 March the DWP published proposals to limit spending on Access to Work, the government’s very successful disability employment support programme. The impact of this will be to set a cap on ambition, restricting the aspirations of deaf and disabled people with anything but minimal support needs and barring people from certain jobs and careers, not because they don’t have the skills but because they have an impairment. Meanwhile, employment rates for disabled people are still below the 2007 figure. We would urge the new minister to think again. Below is NUBSLI‘s response to the Daily Mail article “£1million sign language fraudsters guilty of scamming taxpayer to fund luxury holidays including claims to work 21-hours-day” (5th June 2015) – we see this as an attack on Deaf BSL users as well as BSL/English interpreters. We will not allow the government’s divisive tactics to work. In yesterday’s article, the Daily Mail reported that two sign language interpreters had defrauded the Department of Work and Pensions (DWP) via the Access to Work scheme. The National Union of British Sign Language Interpreters (NUBSLI) have checked the names of the individuals involved and can confirm that neither of the two individuals being charged were members. Whilst it is believed Angela Poole may have been registered as a British Sign Language (BSL)/English interpreter, George Taylor was not. The ‪#‎ScrapTheFramework‬ campaign was recently established to oppose the government’s bid to establish a national framework for interpreting and translating. The initial drafts of the framework did not provide adequate safeguarding or a requirement for interpreters to be registered. Agencies have the potential to use unqualified people and charge extortionate amounts whilst driving down the fees paid to properly regulated and qualified interpreters and translators. The article in today’s Daily Mail was a direct attack on both BSL/English interpreters/translators and members of the Deaf community. With the government pushing ahead with caps and changes to the Access to Work scheme that will see Deaf and disabled people struggle to keep their jobs (for more information see: https://stopchanges2atw.wordpress.com), and the Crown Commercial Services currently trying to establish a framework to drive down interpreters fees, the timing of this article is no coincidence. NUBSLI will be meeting the new Minister in July to explain more about the BSL/English interpreting profession and the importance of only using registered fully qualified or trainee interpreters. They will also take the opportunity to remind the government that they too rely on BSL interpreters to fulfil their basic statutory duties to Deaf BSL users.